The Mainstreet Classics 42-Inch Table Top Air Hockey Game can supply all the fun of air hockey, without taking up the majority of a game room with an expensive table. The compactness of the table enables easy storage and portability for condensed fun anywhere with a table or flat surface. A 12DC motor with adapter provides steady air flow for more realistic air hockey action. 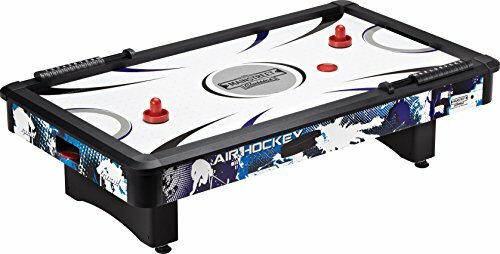 The Mainstreet Classics 42-Inch Table Top Air Hockey Game includes two pucks, two pushers (mallets), and two sliding scorers for scorekeeping. Dimensions: 42" L x 24" W x 12" H.
View More In Air Hockey. If you have any questions about this product by Mainstreet Classics by GLD Products, contact us by completing and submitting the form below. If you are looking for a specif part number, please include it with your message.